Communities across the UK will soon be celebrating the Chinese New Year on January 31st. One of the biggest traditions is to set off Chinese lanterns…a dangerous custom that is under mounting scrutiny. This year, there are planned displays in many major UK cities. They are, however, frowned upon by fire brigades and many public officials. Following, a blaze in a West Midlands recycling plant, caused by a stray sky lantern, many UK MPs and farmers campaigned for them to be banned in the UK. The said fire, that occurred on June 20th 2013, went up to 6,000 feet, injured 11 firefighters and cost £6m in damages. Yet still, we are unable to make the same connections our ancestors made some 20,000 years - that fire burns – that what goes up, must come down. The very idea of releasing a naked flame, with no idea where it will land is shocking. They’ve already been banned in a number of countries, including Spain, Germany, New Zealand, Brazil, Australia and in some places in the USA. 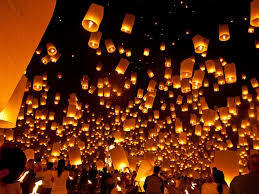 Chinese lanterns are particularly troublesome to farmers, whose buildings and fields could be set alight. Even if a fire doesn’t break out, farmers use machinery that chops lanterns into tiny little pieces. Grazing livestock then chew these pieces. Wire eaten by an animal will result in agonizing pain. It’s better that you don’t use them at all, but as a minimum compromise, there are safer alternatives available. Ones that are wire-free, biodegradable and made from flame retardant materials. Some models even have flame retardant blankets that sit underneath the fuel cells, to minimise the risk of fire when the lantern returns to ground.